The Corncrake has almost perfect camouflage plumage, and can be almost impossible to see, rarely venturing out of dense vegetation. Note the grey areas on this birds head and the black streaking on the brown back. Also note the white feather tips on the birds flanks, these can be very pronounced in male birds during the breeding season. 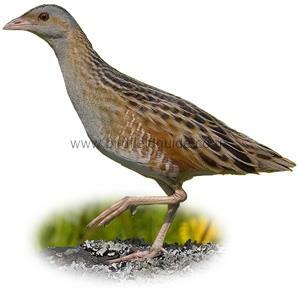 The male Corncrake has a tawny brown back, soft grey face and a short pink bill. It's throat and breast is pale grey. The female has less grey than the male. A widespread but sparse summer visitor to Southern Europe. A rare and localised breeding bird in the UK, almost completely confined to Western Scotland. Considered a red list species due to massive decline in recent years. Grassland, meadows, nettle beds and areas of flag iris. 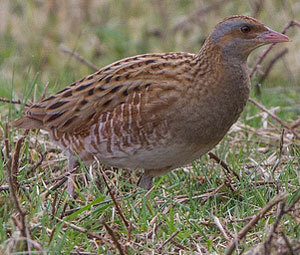 The Corncrake is now a very rare bird in the UK. It's decline is thought to be due to mechanised methods of grass cultivation and the use of pesticides. Large areas of farmland are now managed by the RSPB in Western Scotland in a way which allows the bird to complete it's breeding cycle before hay is harvested. In these managed, localised areas the Corncrake is relatively common, although it is extremely hard to see and is most often heard calling during the spring and summer months. Rare footage of a Corncrake calling. Soft grey face, neck and breast. Female has less grey.